January 20, 2016 – IK Multimedia is pleased to present iLoud® Micro Monitor, the smallest active studio reference monitoring system in the world. The latest addition to IK’s iLoud range of portable monitoring solutions, iLoud Micro Monitor is a serious and reliable sonic tool that provides high-quality sound in a small enclosure at a price that everyone can afford. With iLoud Micro Monitor, musicians and producers now have a way to critically listen to their music no matter whether they’re mixing in a small makeshift recording space, mastering in a hotel room, producing in a larger studio or just listening at home. 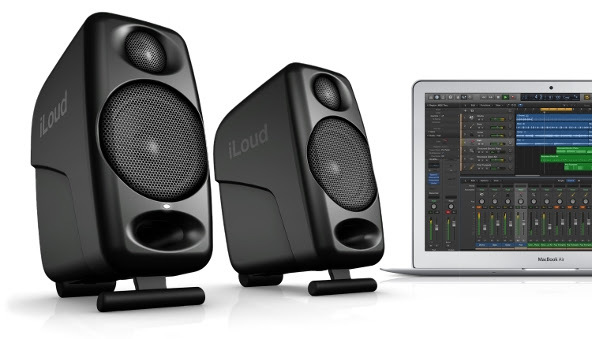 iLoud Micro Monitor delivers stunningly clear and accurate audio. It’s able to do this thanks to its impressive technical specifications and smart design: Its two speakers are powered by four ultra-efficient class D power amplifiers that push out a combined 50 W RMS of power. Each speaker sports a ¾” silk dome tweeter, a 3″ paper cone performance woofer and a large flaring front-firing bass reflex port. Its sound is characterized by pleasing high frequencies, an exceptionally “open” midrange and a solid, controlled low end. 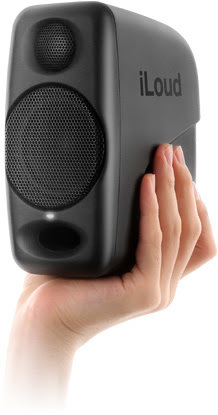 iLoud Micro Monitor provides a flat and linear speaker response in any listening environment. It’s able to do this thanks to its on-board 56-bit digital signal processor (DSP). This DSP handles the frequency and phase response of the monitor and also manages the dynamic range so that the drivers are always controlled. It also acts as a digital crossover allowing for invisibly smooth transitions between the drivers themselves. This DSP can be adjusted to suit different listening environments thanks to three EQ switches: One for treble, one for bass and a “DESKTOP” toggle that lets users optimize iLoud Micro Monitor for use in either a free field or desktop setup. iLoud Micro Monitor can also be physically positioned at two angles of inclination. iLoud Micro Monitor’s flexibility allows it to deliver stunningly accurate and detailed sound for mixing in any space – from cramped bedrooms to large studios – without the compromises in sonic quality normally associated with small monitors. Simply put, iLoud Micro Monitor’s sound is so good that it’s nearly inconceivable for a speaker system of this size and at this price point. Beyond its technical specifications, iLoud Micro Monitor is also incredibly portable. Its two speakers are small enough to fit in a gig bag or backpack – which makes it an essential travelling companion for anyone who needs to critically listen while on the go: musicians, producers, engineers, videographers and more.iLoud Micro Monitor can also be used with a variety of audio input options. It accepts both RCA and 1/8″ wired connections and can also be paired for Bluetooth streaming with all Bluetooth audio streaming-enabled devices. With its portability and comprehensive input options, iLoud Micro Monitor is able to provide ultra-linear sound anytime and everywhere.